Jodi and Patricia, thank you for your post to the Tazza D’Oro Blog. I wanted to add a comment, but I also wanted to show a picture of how I am staying connected. 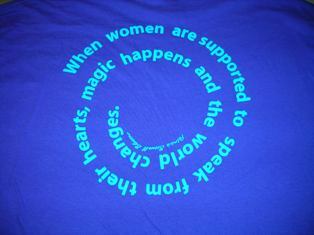 I love my Conversation Cafe T-Shirt, many women have already retuned to Tazza D’Oro wearing their shirts too. Thank you for this gift. We have these shirts at Tazza D’Oro. Do you have one? BRAVO I loved seeing the T Shirt and Patricia's inspiring quote on the blog. I too wore my shirt all weekend and my back felt covered.